There is something endearing about a protester who camps out on Wall Street carrying a sign that reads "I love humanity, let's figure this s**t out together". OK, he wasn't quite as discreet with the swear word, but my editors will frown if I replace the asterisks with the actual letters. But seriously, how angry can you really sound if you begin your revolutionary bank-bashing with the words love and humanity? It is somehow so very un-European. It's hard to imagine, for example, the hooded youths of the London riots pausing between rock throwing and shop-looting to utter poetic affection for their fellow human beings. Their priority was Sony or Samsung (stolen plasma TVs that is), not sitting down with their political opponents to figure out the country's economic problems. Nor do these Occupiers of Wall Street yet have the fury of the tens of thousands who turned out in Athens again last week to protest government cuts. Those youths smashed paving stones and hurled rocks. They were met in return with police firing tear gas. Teachers, air traffic controllers and even jail wardens all joined the general strike against the government's austerity measures. Unemployment in Greece has hit a depressing 16% since the cuts began, so perhaps it's not surprising that violence has struck the capital. And remember, last year, three bank workers died during Greek protests. Even the schoolchildren who turned out in Spain were more numerous than their American counterparts. Some 85% of students in the capital Madrid boycotted classes last Thursday as part of a nationwide protest against the government's cuts to the education budget. "Less vultures, more desks" read one slogan. Youth unemployment in Spain is running at 40%, so it's not surprising that students are somewhat less than happy. No, the most extraordinary thing about the US protests so far is that they have been so mild. It took Americans a long time to jump on the European protest wagon and now they've finally done so, it's with exemplary order and calm. Given how rough the American economy is, that's quite surprising. We all know people who can't find a job, who are struggling to pay bills, who pass through the Safeway checkout fearful that food prices have risen again since last week's grocery shop. And we see the numbers about growing inequality in America. In these times of job cuts and extreme hardship, the fact that the wealthiest 1% of the country took 8% of the GDP three decades ago, but now gobble up 25% of the total economic pie might be enough to make some people reach for their molotovs. So it's interesting that - barring the one incident of pepper spray used against demonstrators on Brooklyn Bridge - the nice people camping out in Zuccotti Park have been well, so nice. And it's not that Americans can't riot - they've done so with force in the past. Remember Vietnam, LA, the race riots in Detroit? But those were in the 1960s. In recent decades protests in the US seem to have become more peaceful, even more subdued. That other political protest movement of recent times, the Tea Party, might get fired up by their deeply held convictions, but they certainly don't riot. The same quality of civic duty and lawfulness that foreigners find so distinctive about American life in general has dictated the mood of the economic protests as well. 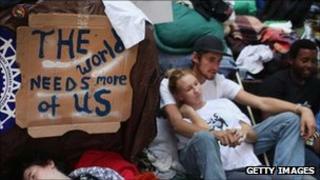 Occupy Wall Street shares the same concerns as the Anger of the Acropolis, but so far, not the deadly stone throwing. Who said it: Wall Street Occupier or Tea Partier?